This activity was created to show the student various interdependencies of a television show. A faculty member approached me and asked my help streamlining the topic of business frameworks for a media entity. He wanted an interactive way to show the business relationships. 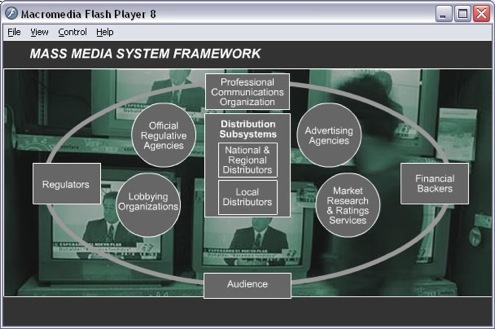 Although the framework theory is applicable to any media production, this activity centers around a popular television show. Each area of the show’s framework is hyper-linked to mini-activities designed to highlight each part of the complicated relationship. I used Flash to give some animation audio and interactivity to some of the sections. This entry was posted in Interactive, learning activity, training and tagged Arts and Sciences, business, communication, flash, media production, tv by Britt Carr. Bookmark the permalink.